A fun game to practice addition facts to 8. Perfect for the beginning of the school year and a great way to get the wiggles out! 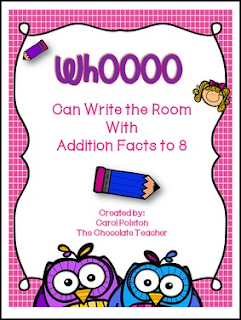 Included are 24 cards to tack up around the classroom, a recording sheet and a teacher answer sheet. Thanks for stopping by my store. Please take the time to look at my other products. Thanks!